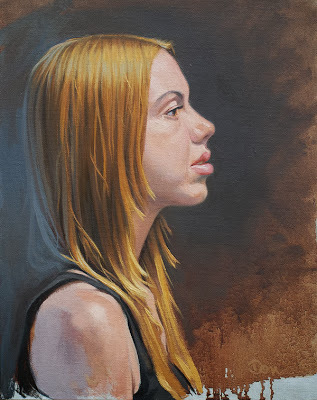 From Life by Don Stewart: "Brittney's Profile"
I painted this portrait using a limited palette of Yellow Ochre, Terra Rosa, Ivory Black and Titanium White. The canvas was toned a neutral gray and I used Burnt Umber for the block in. As I've explained here before, these earthy versions of the primary colors are nearly the same as those used by Swedish painter Anders Leonard Zorn (1860-1920). But, instead of Terra Rosa, Zorn used Vermillion (or modern-day Cadmium Red). Other earthy reds like Venetian Red, English Red Light or Light Red Oxide work well, too. Using this limited palette has its benefits. The muted color scheme creates color harmony and unity with no effort at all. 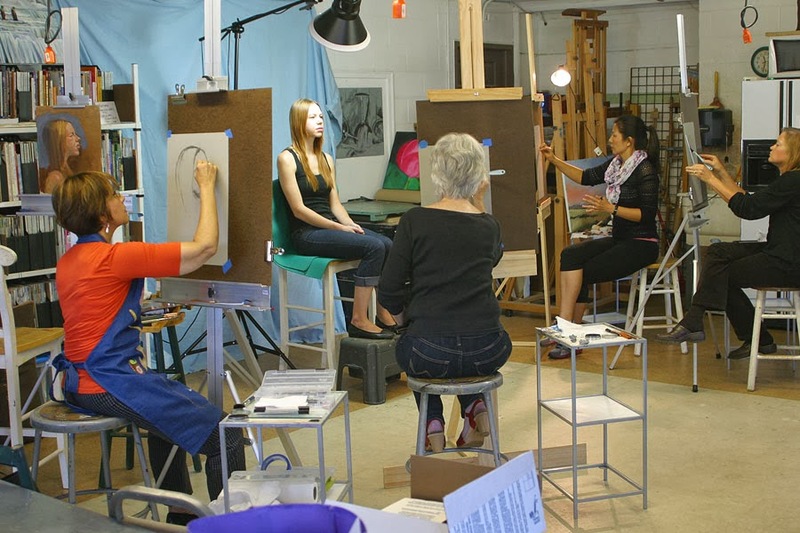 It's also a good teaching tool, because beginning students can learn how to manipulate oil paint without the concern for exact color-matching. The subdued tones also help students recognize complimentary colors and strengthen their understanding of the color wheel. I began this painting from life along with my portrait drawing class, then finished it from a photograph. You can see it in the beginning stages, along with a few students and our lovely model Brittney, in the photo posted below.